The Excel 3 in 1 module offers the ultimate in flexibility, space utilisation and ease of installation. The totally modular design allows the mounting of up to 3 shuttered RJ45 ports in a standard flat or bevelled single gang faceplate or up to 6 in a double gang fascia. 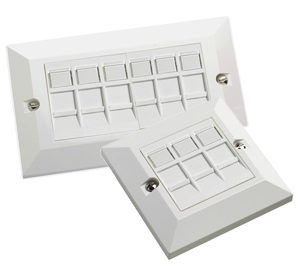 The unique design means that you only load shuttered outlets as required, any capacity within the plate which is required for a later date is simply blanked off, providing a neat and easy to use completed installation. 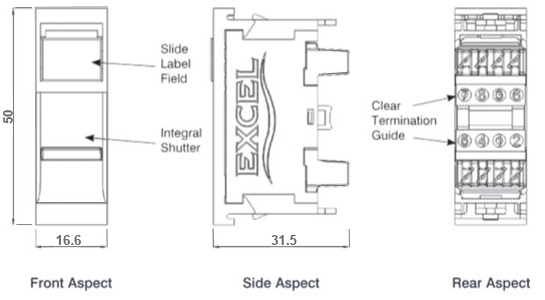 Individual port labelling is also quick and easy with standard Excel outlet slide in fields incorporated into the design. As well as providing link and channel compliance - when installed with Excel category 6 components – with the aforementioned specification - the outlet is also backward compatible with Category 5 and 5e components. Pre-assembled faceplates can be ordered to save installation time.